I’ve talked to a few people in the past about the MXR Dyna Comp pedal, but this morning I came across a demo of the MXR ’76 Vintage Dyna Comp pedal, where MXR built it to specs (including the CA3080 Integrated circuit). I think it’s cool that they’re reissuing these older style pedals (like the ’74 vintage phase 90 aka script 90). In the quest for ultimate tone, a compressor is an indispensable ally. 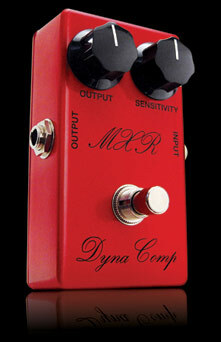 And the MXR Dyna Comp that was produced in 1976 has long been regarded as the ultimate stomp box compressor. There’s something inherently musical in the way it “tightens up” a guitar signal, raising the volume of quiet notes and leveling off peaks to create rich, full bodied sustain. From country twangers to metal monsters, guitarists have long relied on the MXR Dyna Comp to make their riffs stand tall in any live or studio mix. Now the MXR Custom Shop brings back that highly sought-after sound with the ‘76 Vintage Dyna Comp. Meticulously researched and superbly crafted, it features the exact same circuitry used in the original 1976 Dyna Comp, identical in its component layout, silkscreen and handmade wire harness. The key component is the old school CA3080 “metal can” integrated circuit (IC), which yields quieter operation, greater transparency and increased dynamic range. These ICs have been out of production since the ‘80s, but MXR has tracked down a stash of them—enough to produce a limited run of these little red boxes of compression bliss. With supplies limited, the MXR ‘76 Vintage Dyna Comp is destined to quickly become as ultra collectible as its noble ancestor. According to their site, this pedal is only available via their Custom Shop, but you can purchase the MXR ’76 Vintage Dyna Comp pedal at Amazon for a $175.00 (which includes FREE shipping). Remember, if you like reading about pedals and seeing videos reviews from others, please subscribe to the RSS feed and get notified via email when there are new postings! Re-release of MXR Micro Flanger and MXR Micro ChorusCommunity Question Results "What do you think is the best compressor pedal out there.. and why!"